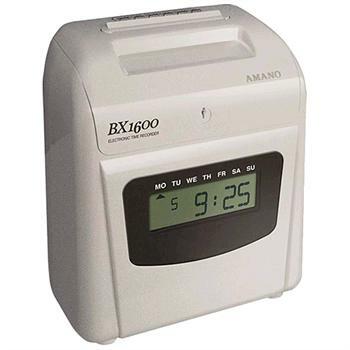 The Amano BX-1600 is a small business electronic time clock ideal for office environments with a small number of employees. This BX1600 is a reliable solution for companies wanting to easily track their employee time transactions using a column-print style time recorder. All the features of standard electronic time clocks (automatic time and date adjustment including Day Light Saving Times, clean and easy to change cartridge ink ribbon, and passive battery back up retaining time and date until power is restored) makes this time clock a great value for those looking for quality and affordability. Amano offers a one-year manufacturer's limited warranty. Warranty does not include consumable parts. With few exceptions, all are return to depot for service. User must pay for shipping to depot. Repaired products will be returned with shipping charges prepaid.